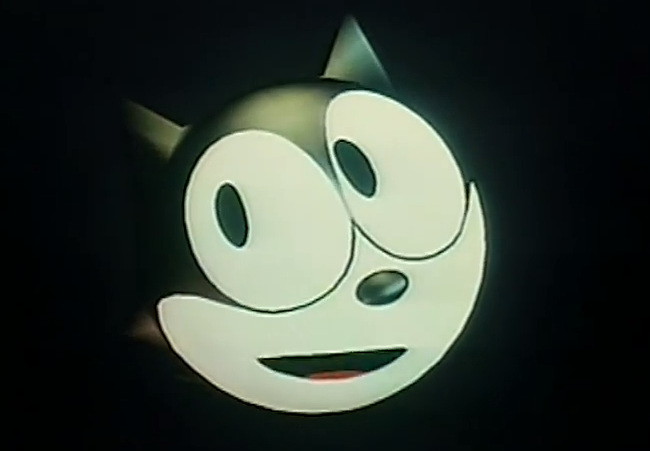 If I were asked what the weirdest movie I’ve ever seen is, I can answer with no hesitation that it’s Felix the Cat: The Movie. This 1988 feature film adventure based on the world’s oldest cartoon character is as strange as its production is lacking. Although its imagination is often commendable, its storytelling and animation leave a whole lot to be desired. 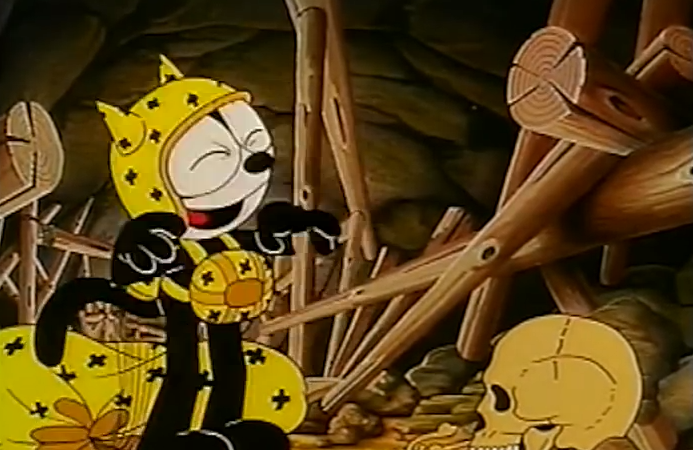 Felix the Cat: The Movie tells the story of the kingdom of Oriana, a land that exists in another dimension. Oriana’s princess (also named Oriana) has disbanded the nation’s army and rid it of its weaponry… which naturally does nothing but make it easy pickings for the villainous Duke of Zill to conquer the land with his army of robotic cylinders. Princess Oriana rushes to her dimensporter – a device used to travel between dimensions – in order to contact a “dark stranger” who is prophesied to save their kingdom. Before she can access the machine, however, she is kidnapped by a group of cylinders. But the princess sheds a single tear, which takes on a life of its own as it becomes a glowing bubble, and accesses the dimensporter to travel to the world of Felix the Cat, whom it then escorts to the land of Oriana (it should be noted that the film never mentions the princess having any magical powers, so how her tear manages to accomplish any of this just comes out of nowhere). Meanwhile, classic Felix characters the Professor and Poindexter are after Felix’s magic bag, and follow the cat into the alternate dimension. If this sounds weird already, it’s only the beginning. 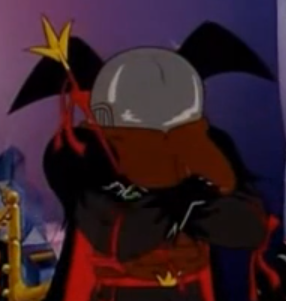 Felix eventually ends up in the land of Zill, and becomes a prisoner to a circus run by a goblin-like lizard man named Wack Lizardi, who is also keeping the princess hostage under orders of the Duke of Zill. There’s also a scene where Felix and friends run through a forest of hair while avoiding bird-headed head-hunters. The Duke is after a sporadically-mentioned magic book in what seems like a tacked-on subplot. There’s just a lot going on, and not nearly enough running time or budget to cram it all in. I’m going to be honest, I actually like the concept of the film. The idea of throwing a classic cartoon character like Felix the Cat, and having him become the savior to a fantasy world has the potential for a lot of fun. That’s basically the foundation of the Super Mario video game series, and the graphic novel Bone proves what a storytelling goldmine combining cartoon characters and fantasy worlds can be. But even comparing Felix the Cat: The Movie to such works is being far more generous than it deserves. When I speak of the film’s weirdness as a negative, I don’t speak for the odd nature of its world. If anything, the imagination the filmmakers tried to put into the lands of Oriana and Zill, and the creatures who inhabit them, are a worthy attempt. And Felix the Cat has always been associated with surrealism, so it isn’t exactly out of place. What prevents the story from reaching any of its potential is how strangely it all just kind of falls together. The concepts behind the plot are well-intentioned, but the way everything progresses just seems to happen at random, are frequently rushed, and are often resolved by deus ex machinas. Most of the events of the film just kind of happen, and they segue into the next scenes with very little (if any) proper means to do so. The aforementioned tear inexplicably transforming is only the beginning. Pretty much every scene is resolved (or more accurately, abruptly ends) in a similar fashion. This is a movie in which weird characters more or less do weird things as a means to get to the next weird thing. It’s really hard to describe in words, really. This probably has more than a little to do with an obviously limited budget. As stated, the story the filmmakers came up with actually has some decent potential, but they clearly didn’t have the means to tell it. So everything just kind of zips by at a lightning pace, regularly moving forward via entirely random cop-outs. This is especially apparent with the film’s ending, which is so incredibly rushed and filled with deus ex machinas that it almost screams “oh crap, we ran out of money!” through a megaphone. Perhaps the filmmakers should have gone with a smaller story that they were better suited for? This limited budget is also painfully present in the animation itself. While many of the character designs are so off-the-wall and bizarre that they add some visual fun to the film, the quality of the animation itself is severely lacking. The characters move stiffly and sporadically, there are glaring flaws with editing, and more than a few instances of recycled animation are present. It’s just not a pretty film to look at, even if its odd creatures are occasionally intriguing. Another oddity of the film are its songs, of which there are only a handful. Most of these songs – like so much else in this movie – just kind of happen at the most random times, with no build-up or proper segues into them. The songs themselves really aren’t memorable, and mostly play in the background and only last for a short time, then disappear. One exception to this is the song “Who is the Boss?” a kind of anthem for the Land of Zill that extolls the “virtues” of its dictator, which comes in the forms of an 80s rock tune. Unfortunately, the song’s presence in the film is drowned out by all the lizards and goblins joining in, but the soundtrack version is fun with its cheesy 80s goodness. While Felix the Cat: The Movie had countless viewings from myself as a child, it simply is not a good film that no amount of nostalgia can save. I will applaud how it creates a fantasy world that fits in with the surrealism of the Felix the Cat brand, and I like the backstory the film gives to the Duke of Zill (he was once a scientist of Oriana, built a robot body for himself after an accident left him disfigured, was banished from the kingdom for trying to steal its ancient secrets, and ended up in the land of Zill, whose primitive people worshiped him as a god due to his metallic appearance). If only the story for the whole film were as fun or developed. Felix the Cat: The Movie is simply incoherent with its storytelling capabilities (or lack thereof) and feels like a series of cop-outs chained together. Its animation and music also fall drastically flat on their face, thus squandering whatever potential the film may have otherwise had. Felix the Cat may be known for carrying around his magical bag of tricks, but his feature film debut had no special tricks to speak of. And certainly no magic.